No matter how many times you ve heard these classic Fifties hits, you ve never heard them like this - unless you were in the studio when they were recorded! Why? Because every one of these 31 original hits appears in jaw-dropping new or rare STEREO, most for the first time ever. Hearing the original hit versions of these all-time classics in crystal-clear stereo is like hearing them for the first time. Believe it or not, 24 of these famous hits have never appeared in stereo in their correct hit-single versions until now. And these are really huge hits, like Bill Haley s "(We re Gonna) Rock Around The Clock," Gogi Grant s "The Wayward Wind," Paul Anka s "Diana," and "My Prayer" by The Platters. And those are only four of the thirteen #1 hits on this CD. These stereo mixes will surround you with vocal harmonies, orchestras, drums, and electric guitars. The swelling strings and stirring crescendos of The Skyliners "Since I Don t Have You" and Nelson Riddle s "Lisbon Antigua" will sweep you off your feet. You ll hear new instruments, voices, and other details that you never noticed before, on a selection of hits that span the full spectrum of Fifties pop music: R&B, rock & roll, pre-rock pop, orchestral instrumentals, and more! Check out the track list and then listen to the sound samples. (To find, just Google this phrase "Listen + 31 Amazing Stereo Hits"). You won t find these exclusive stereo cuts anywhere but on this CD. These Stereo original hits are simply not available from download services like iTunes and Spotify. Includes a 12-page booklet with complete song-by-song annotation and liner notes by Greg Adams. 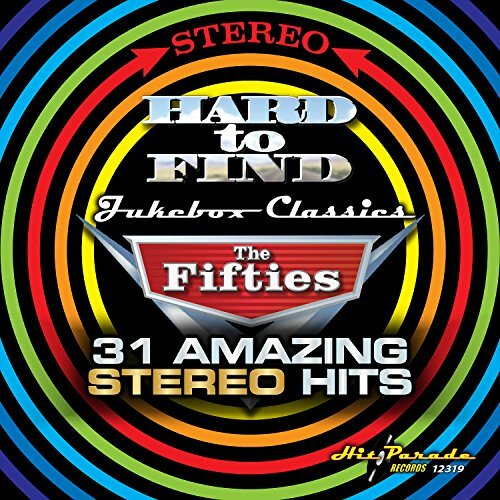 Also check out the great companion volume Hard To Find Jukebox Classics 1960-64: 30 Amazing Stereo Hits. THIRTEEN #1 HITS! ALL 31 SONGS IN STEREO! 78 MINUTES OF MUSIC!